View cart “HP Velotechnik Gekko fx 20″” has been added to your cart. In the promising class of fast electric bikes, HP Velotechniks Scorpion fs 26 S-Pedelec focuses on secure road holding for a multi-track vehicle with chassis technology from the automotive engineering sector. 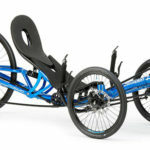 The touring trikes low center of gravity and the good rider support in the ergonomically-designed recumbent seat enable dynamic acceleration. 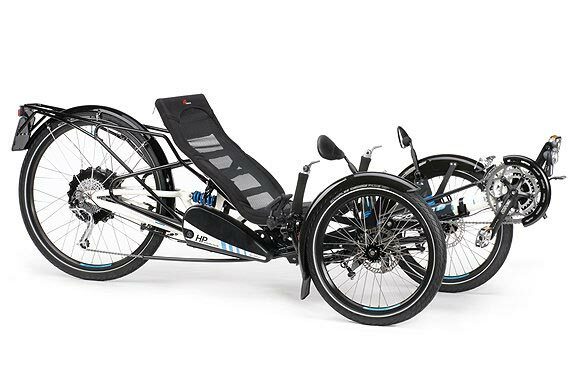 The low air resistance thanks to the efficient recumbent position extends the rechargeable batterys range, especially at the high assisted speeds of up to 45 km/h reached by the speed pedelecs. At such high speeds, a well-aligned, full-suspension chassis is extremely important. The Scorpion fs 26 touring trike is the perfect basic vehicle for powerful motorization and high average speeds of over 25 km/h. The speed pedelec is driven by a high-performance 500 watt rear wheel hub motor. A 36 V Li-Ion rechargeable battery with a 558 Wh capacity provides a great deal of energy. The recuperation function, which uses the motor as a generator when braking, extends the range through energy recovery. 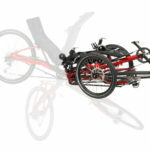 The trike comes with a start assist function as standard, which propels it to a speed of up to 20 km/h at the push of a button without pedaling. Note: Please consult your dealer for your local legal requirements. The maximum allowed speed may be different.